Sometimes I long for the simpler days of yore. When iTunes was a music player and didn’t have all these complicated features, and perplexing clouds that make listening to music a chore. In this week’s column, I look at some irksome issues with iTunes 12. 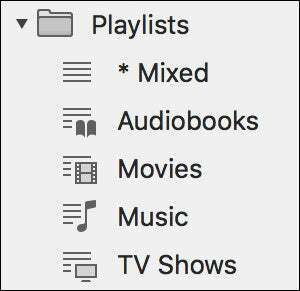 In same cases, you may not see all your playlists in the iTunes sidebar, and I explain why. I explain why you cannot sync videos to the cloud. I look at a question about sharing playlists that contain music that isn’t matched, but rather uploaded to iCloud Music Library. Finally, I look at a question about buying the contents of a playlist. Click here to view all your playlists in the iTunes sidebar. Q: I noticed that several of my playlists disappeared from the iTunes sidebar. I figured out that they are still there but only show under the media kind (music, audiobook) that the playlist contains. Before, the playlists were visible all the time. How do I get all my playlists visible in the sidebar no matter what media kind they contain? iTunes 12.5 changed the way playlists display in the sidebar. Instead of all playlists being equal, playlists now display, by default, only when the media kind they contain is selected. So when you’re viewing your Music library, you see music playlists; when you view your Audiobooks library, you see audiobook playlists. To view all your playlists in a given library, click the sidebar where it says Music Playlists, for example, and choose All Playlists. This displays playlists containing all media kinds, but you’ll need to do this in each library where you want to view all your playlists. Playlists now indicate which type of media they contain. You can also combine multiple media kinds in a playlist; in this case, the playlist icon contains no additional overlay, as you can see above with the *Mixed playlist. (I’ve prefaced the name with an asterisk so it appears at the top of the list.) The first time you try to combine multiple media kinds in a playlist, iTunes will warn you. Note that if you use iCloud Music Library, any music playlist that contains other media kinds won’t sync to the cloud. Q: I have a big bunch of music videos in MPEG-4 format that I downloaded from YouTube using a downloader app. All the music videos play and work fine in iTunes, but when I try to upload them to my iCloud Music Library they won’t upload. I just get a “Waiting” iCloud status icon, but nothing happens. How can I put these videos in the cloud? You cannot match or upload videos to iCloud Music Library; you can only add music to this library. You may see some videos in your iCloud Music Library, but these are ones that come from the iTunes Store or Apple Music. They’re the only videos you can have in your iCloud Music Library. Q: Lots of the songs in my iCloud Music Library have been uploaded, not matched. Most are uncommon remixes, or the odd track ripped from old 12-inch vinyl or a CD that iTunes Match doesn’t recognize. Many of these songs are in playlists I have shared with my partner (under the same Apple Music family subscription). But when he subscribes to these playlists, the songs aren’t there. Sometimes, there will be a substitution, such as the original version of a song where I have a remix in my playlist. Is there some way I can get these uploaded songs into the playlists my partner gets on his devices? When iTunes scans your library, it looks for tracks that are in the iTunes Store and Apple Music libraries, and, if it doesn’t find them, it uploads the music. As you say, these are more obscure tracks, and it’s not surprising that they’re not found. But iTunes doesn’t make these tracks available to anyone but you. It’s possible that some other people have uploaded the same tracks, but if they’re not matched, then they stay sequestered so only the original uploader can access them. To allow your partner to access these songs, he needs to first add them to his iTunes library, then let them upload to his iCloud Music Library. After that, these songs should be recognized in the shared playlists, but I wouldn’t guarantee it. Because of the way non-matched songs are treated, it’s possible that his uploads, even if they’re the same versions as yours, won’t match the songs in your playlists exactly. Q: Is there a one-click option somewhere to purchase an entire playlist, or do I have to (annoyingly) go song by song? You used to be able to do this in iTunes, using what were called iMixes. Unfortunately, this is no longer possible. As you say, you must annoyingly buy each song, one by one.